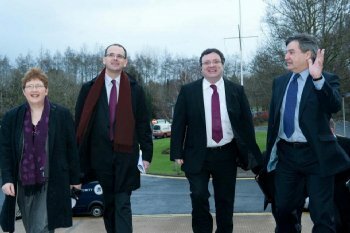 Department for Employment and Learning Minister, Stephen Farry, last week visited the Coleraine campus of the University of Ulster to receive a briefing on the University's work in the field of teacher education. In the course of an hour long meeting with staff and students from the School of Education, the Minister was given an extensivetour d'horizonof the work of the School, and metUniversity of Ulsterstudents studying to be teachers. "The Minister was very well-briefed, and it was clear he had read his briefing papers very carefully. He knew a lot about what we do here at Ulster, and wanted to find out more. He asked some challenging questions, and my colleagues were very keen to answer and engage with him on the issues facing teacher education providers in Northern ireland. "He gave a clear indication that his priorities are both for integrated approaches and cost effective approaches – and the University of Ulster's provision performs well against those criteria."